Dreamfields pasta is promoted as a low carb product. But it’s made from durum wheat and it tastes great. Actually, it looks, feels and tastes just like… regular pasta. Now, regular pasta is anything but low carb. It’s mostly starch, which turns into glucose in the gut and is absorbed as blood sugar. Exactly what low carbers try to avoid. Dreamfields pasta has 41 grams of carbs per serving. How can that be low carb? Well, Dreamfields claim that their “patent-pending” (since 2004) recipe and manufacturing process protects the carb from being digested. It sounds fantastic. But is it true? I decided to find out and the results were shocking. Can you be a low carber and eat all the pasta you want? Can you have your (low carb) cake and eat it too? If their “patent-pending” manufacturing really made the starch indigestible, would that not affect the taste? (It’s great). If the starch really became indigestible, should it not end up being digested by bacteria in the large intestine, causing massive flatulence? (It does not). Now it’s time for answers. Here’s my package of Dreamfields pasta, bought in a “low carb” store. There you have it: 36 grams of non-fiber carbs per 56 gram serving. It adds up to about 80 percent energy from carbs. That’s about as high carb a food as you could find. Of course – most of it is supposedly indigestible. I tested the pasta myself, eating it and testing my blood sugar 21 times. We’ll get to the test shortly. It may sound too good to be true. But even if it was true, consider if it really is a good idea for the future. Should the food industry manufacture food that our bodies can’t absorb? Do we really need to chew food that doesn’t make us satiated, food that gives us no energy, food that isn’t real food? Is it environmentally sound to grow wheat and then chemically modify it so that it loses its nutritional value, manufacture pasta, transport it, sell it, cook it and then sit down to eat it, all of that to create some extra poop? That’s an interesting philosophical question. But let’s leave it and find out if Dreamfields pasta works. 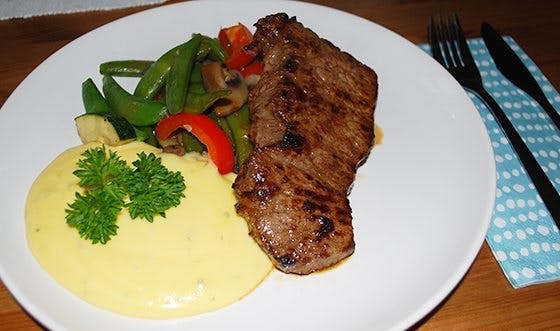 A steak, Béarnaise sauce and a pile of vegetables fried in butter. Possibly a glass of red wine. The result is long-lasting satiety and well-being. A meal like this contains a few grams of carbs – perhaps five. The result on my blood sugar? Hardly any at all. It usually stays at fasting levels, between 86 and 94. If you don’t eat anything that turns to sugar your blood sugar stays the same. Very logical. Here is one serving according to Dreamfields, 56 grams. It’s not a lot of food for someone who is 6’7” (me). These 112 grams of pasta contains 72 grams of starch and sugars according to the Nutrition Facts. But according to Dreamfields only 10 grams are absorbed. After boiling (according to instructions, exactly 9 minutes) it turned into a decent portion. About the amount I used to eat when I ate pasta. I had the pasta without any other food, with a glass of water. It tasted fine, about the way pasta usually tastes. It didn’t start out too bad. My blood sugar did quickly rise to 108, but then it looked as if it was stabilizing. I was impressed, it didn’t look too bad. But that was just the beginning. Then came a mountain of blood sugar. After two and a half hours the blood sugar was still as high as 131! It turned into a long evening. I tested my blood sugar every 20 minutes and hoped that it would go down so I could have a real dinner. Weirdly enough I felt hungry at the same time as my blood sugar was high. Perhaps some other nutrient was missing in my blood giving me feelings of hunger. Protein? Fat? I had no other food until the experiment was completed. After seven and a half hours (!) I gave up, even though the blood sugar was still a bit higher than normal. I ate some real food and went to bed. Here are five different blood sugar curves to compare. The Dreamfields pasta contain slow carbs. Perhaps it’s OK to call it low glycemic index carbs. But it’s not low carb. It’s the opposite, it’s almost pure carbs. It’s absorbed slowly, but most (if not all) of the starch is absorbed. There is no way only ten grams of carbs spiked my blood sugar for seven hours. I have eaten more than that with just minor effects (see above). Dreamfields’ marketing claims are not true. Dreamfields are sabotaging the weight loss of low carbers just to sell more of their pasta. Unless, perhaps, I’m a weird exception. Does it work for everybody else but not for me? I did the test above last year, for my Swedish blog. I was convinced that Dreamfields pasta was a fraud. The main authors of the article are Frank C. Nuttal, PhD, and Mary C. Gannon, PhD. They have previously studied the effects of low carb diets, so they were surprised by Dreamfields’ claims that pasta can be low carb. After “numerous attempts” to have a look at the data that Dreamfields base their claims on (not allowed) the researchers decided to test it themselves. Five participants ate the Dreamfields pasta (50g CHO) and tested their blood sugar. Then they ate the same amount of regular pasta and tested their blood sugar for comparison. Pretty shockingly the results on the blood sugar were just the same with Dreamfields’ and regular pasta. No difference! The researchers were surprised so they recruited five new participants and did the test again. The result were the same once again – no perceptible difference. Nuttall, FQ, et al. Glycemic response to ingested dreamfields pasta compared with traditional pasta. Diabetes Care. 2011 Feb;34(2):e17-8. 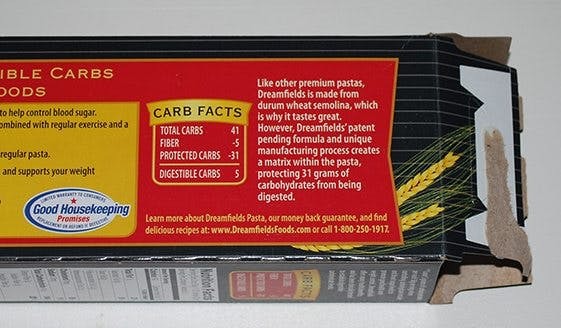 Dreamfields have been selling their fake low carb pasta since january 2004. It’s quite popular. There is no way to know how many people have failed to lose weight because of it, concluding that “low carb does not work”. Low carb usually works just fine. But not if you eat a lot of pasta. Real healthy low carb food is meat, fish, vegetables and butter, ideally from your local farmer. Dreamfields and companies like them have turned “Low Carb” into a joke, just to make money. Obese people who trust them just gain weight. But diabetics spike their blood sugar and may end up amputating their feet and becoming blind. There are a few possible explanations. Either Dreamfields and others like them are ignorant, evil or just plain greedy. Probably greed is the most likely explanation. Also, they probably think that consumers are stupid. But they are wrong about that. The pasta fraud is revealed. You can help your friends. If they eat fake low carb products and have trouble losing weight, chances are that’s why. Spread the word. Let’s make low carb work again. Real low carb. Moore on Dreamfieldsgate – Interview with the Pasta President and even more evidence that Dreamfields pasta is just like any pasta: high carb. Go to Dreamfields’ Facebook page and like the link to this post*. Let’s spread the truth to all of the 29 000 members. Dreamfields have gotten away with fooling overweight people and diabetics long enough. */ You have to like Dreamfields first, but then you can easily “unlike” it again: bottom left side of the page. Of course you can spread this info via your Facebook, Twitter and blog too if you’d like. Feel free to copy any part of it. If you link to this post it will appear higher in the results when people search for “Dreamfields pasta” on Google. It’s already #14 or so. Spread the word so that fewer diabetics and others are hurt by these fraudulent marketing claims. I successfully went on Atkins for life about 6 years ago. i lost about 20 lbs and have kept it off and stayed within a 5 lb range. I started having Dreamfield's pasta about 5 years ago. My family of five is not low carb, but they all prefer the taste of DF to regular pasta. It has a kind of nutty flavor to it and i always have some plain after having a serving with meat sauce because i just like the flavor. i never measured my blood glucose, but it has definitely worked for me. I recently stopped weighing myself as often, but i used to weigh myself twice a day religiously and kept a food journal. Since everyone's body can have different reactions, i tested everything myself using my weight and body fat % as the measurement. After about 3 years of doing it, i can basically guess my weight the next day within 2 tenths of a pound based on what i ate the day before and what exercise i did. I digress... I order DF pasta by the carton every few months. I'm about to place an order in the next hour. I was pretty upset when i heard about the lawsuit and that it wasn't low carb. But, then i quickly realized it didn't matter, because for whatever reason, the pasta was working for me. So, we kept buying and consuming it. Based on some of the other comments here, i see that i'm not alone. This makes me feel better and more confident it is ok to continue consuming. I am a little late to this party...but I skimmed through most of the recent posts. I was using Dream Fields pasta for testing recipes...it was my go to pasta until I started noticing that the packaging has been changed and it no longer claimed to be 5g NC per serving. It is interesting to now understand why. I agree that everyone metabolizes food differently. I do think it is incredibly important however for food manufacturers to be truthful in their claims across the board. If it does not work for a large percentage of people then those claims should not be made. Unfortunately, when it comes to manufacturing food it is always better for each person to know how they feel when eating foods regardless of what companies claim. For me, blood glucose readings are hard evidence...what a person feels (in physcial reaction) to eating certain foods is also highly relevant and generally more ideal for every day. However, this is much harder done than said. Thanks for posting such a terrific eye opening post. I have had the same experience as Solomon. I have spent years on a low carb diet and have eaten Dreamfields with great results. I do not get the big crash I used to with regular pasta and do not gain weight despite eating large servings. I don't measure my blood sugar and perhaps the label is misleading, but I got the results I wanted from it. I've been eating Dreamfield pasta for about 10 years and it works for me. It is the only pasta I can eat without having a huge bg spike afterwards. I don't eat a lot at a time and always balance out with protein and veggies. Who ever created this post in the first places comes off to me as an ignorant person because they forgot to read one small detail in the nutrition facts. AMOUNT PER SERVING. In comparison to Barilla Angel Hair pasta and Angel Hair whole grain pasta, the amount per serving on the Dreamfields is double the serving for regular pasta. My husband is a diabetic and we haven't tried this pasta just yet, but I have every reason to believe that it will help tremendously in comparison to other pastas. 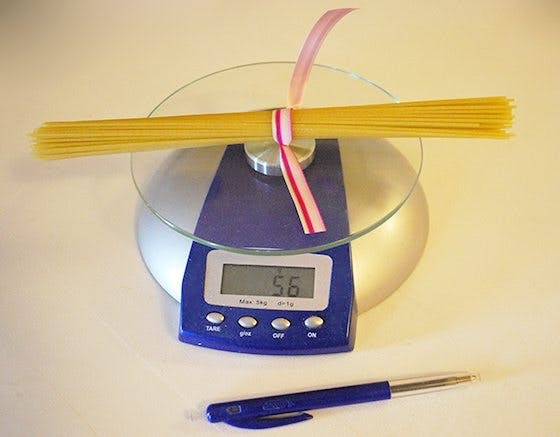 Portion control is key, so all of the people who made claims that the pasta brought their sugar up is because they had double the portion of what they would have if they ate regular pasta. So by having half of the 2 oz, which is the amount per serving in regular pasta, you would be cutting the calories and carbs in half. I hope everyone understands the point I'm trying to make and do the research yourselves before making a final decision. Too much of a good thing is never good. Eve, i feel sorry for you and your diabetic husband if you decide to eat pasta, not to mention the Frankenstein pasta with the bogus chemistry claim. Don't. Simply don't. Not worth the enormous amount of glucose that will surge into your blood and cause insulinogenic response. Really great recipes on this web site that would be much better instead and absolutely delicious. I guess what I have a problem with in this article is that the person who did this test "cheated". On his graph he compared Dreamfields pasta alone while what he compare it to was Bread with lots of butter, meat and vegetable, and a wrap with potatoes and salmon. So a carb ( albeit supposedly a low carb) item against a carb with lots of fat, a protein and low carb vegetable, and a carb with protein. Maybe if he had put butter (lots of it) or had it with meatballs, sauce and some veggies, he would not have been so hungry, and his blood sugar would not have spiked so much as the protein would have helped with that. Also keep in mind he ate a double portion. Total BS. Oh and I use Dreamfields and it works for me too. Type 2 diabetic for 16 years. The Diabetes Article you showed was RETRACTED. P.S. : I'm not defending Dreamfields Pasta, I am also a diabetic patient looking for some good diet options. I am in the throes of cramped suppression here at my work-desk, hunched over like a human comma straining in vain to squelch the mud-horn. This pasta tasted SO good...I over-indulged last night...and now the methane cows have come home to roost. The leftovers are going into the disposal as soon as I waddle carefully home. Everyone's body reacts differently. For my wife and I, Dreamfields works. Pure and simple. Our blood sugars post meal is half of what regular pasta's do to us. To each and your own, but slamming products because it doesn't work for YOU is inappropriate. The study wasn't withdrawn because it was wrong. It was withdrawn because some of the data was obtained before Institutional Review Board (IRB) approval. Human trials have to be approved by the IRB. I think the concept of Dreamfield is real. I have recently found out that cooking, chilling (in fridge overnight), then reheating carbs like pasta and rice changes its molecular structure so that it becomes fiber, well is processed like fiber (undigestible carbs). That apparently cuts down the net carbs and calories down in the same sense that fiber does. I think that's what dreamfield does, probably involving some dehydration process to turn it back into dry pasta. So I bet in the end it will have the same effect as fiber on the blood sugar and gut. And some people will have gas while others won't. I have had type 2 diabetes for 20 years I can eat this stuff with very few negative results regarding blood sugar. It does give me gas the next day. I love it. Really? You think a glucose reading of 131 is HIGH?? (Maybe YOU are the one that's high.) The ADA says that an after meal reading (up to 2 hours) of 120 to 180 is NORMAL for a person with type 2 diabetes. Even my doctor says readings of 150+ are fine so long as they are showing decline after that time. I hit 200 sometimes after some meals when I splurge a little, and I continue to maintain an A1C of 6.5. You can cite whatever "science" links you want, but there IS a BIG difference between regular pasta and Dreamfields pasta in MY glucose readings. GTFO! I, like so many others, fell for the Dreamfields claims. I served this product to my diabetic husband and diabetic mother weekly. I served it every time my diabetic inlaws came to visit, believing I was doing the right thing for my family. I was so proud of this product, which is produced in my home state, and promoted it to our friends and extended family as a 'healthy' alternative. Then I was shocked to learn what I had really been doing to their health. We received a small payment in the fraud settlement but it is small consolation for the deception perpetrated on my family by this company. We make our own oat fiber noodles now from scratch and I KNOW what I am putting on my family's plates. Get ur facts straight before you talk. Everyone's body is different . Thank you dream field I can eat pasta, my hubby can too without neuropathy. ? I'm a newly diagnosed Type 2 diabetic and Dreamfields was recommended by my dietitian. My wife purchased some Dreamfields and I looked at the ingredient statement which states 41g carb, 0g sugar, 0g fat and 190 calories. If only 5g of the carbs are digested by the body, as claimed, then the caloric intake of a 2 oz serving would be 25 calories. (carbs provide about 5 calories per gram) My question is, if only 25 calories are produced from carbohydrates and there is no fat and no sugar where do the other 165 calories come from? If you believe the Dreamfield label almost all of the 41g of carbs must be digested in order provide the stated 190 calories. Either Dreamfields ingredient statement or Dreamfields advertising claim is BOGUS. Dreamfields works well for me. My blood sugar doesn't spike but I do have massive flatulence after eating it. I have been eating Dreamfield's pasta's for over 5 years now. One, because my husband is diabetic and 2 b/c I eat low carb. My husbands number's have gone down and no longer has to take meds for his diabetes, he controls it with eating low carb. I eat Dreamfields and have lost 22 pounds so far. It is delicious pasta and it definitely is low carb. This article is doing a disservice to the brand that does as advertised. Maybe this article is what caused the company to removed the low carb section from it's packaging! Shame on you. I have type 2 diabete, I love pasta and I have been using Dreamfields pasta for years. When I eat regular spaghetti my blood sugar would spike and my blood sugar level would be close to 200. Yet when I eat Dreamfields and test. By sugar levels after the same amount of time I would be in the 120 to 130 range. With Dreamfields I can have pasta without sugar spikes. This goes to show along with many others on here that it works for us. It is understandable that some diabetics have different effects from eating foods, one example my Father in law who is a type 2 diabetic and if he eats greasy foods his sugar levels would spike, yet I can eat greasy foods and they do not have the effect on me. One thing my Doctor told me was to test the foods I eat to see which foods would cause my sugar levels to rise. Dreamfields works for me and I will continue to purchase it! The writer of this little experiment has to realize that a spike in blood glucose of 131 is not a massive spike in glucose levels. A pre diabetic level 2 hours after eating is between 140-190! This is 100% accurate and the writer of this article and experiment is shedding false information. Here are the facts. A fasting blood glucose (minimum 8 hours fasting) below 126 is considered pre-diabetes! Also checking your glucose levels 20 times in a few hours is foolish, will not be very accurate, and certainly this person is not diabetic. Here is the way to determine if this product works. Eat it, wait two hours check your levels, then check your glucose levels fasting after 8 hours. Not every person is the same, not every person will have the same results, pick up a diabetic cook book, learn to count carbs (it's very simple), and stop relying on the internet for accurate information. If you would like to learn more about diabetes then use Google Scholar (scholar.google.com) it's all fact based, peer reviewed and not someones opinion. Don't believe me check it out for yourself, but then again I could be wrong a DMII Nurse Practitioner. Enjoy Dream Fields Pasta I only use it and have no issues with spiking glucose levels. i have eaten this pasta for over 10 yrs and have maintained a low weight because of it. 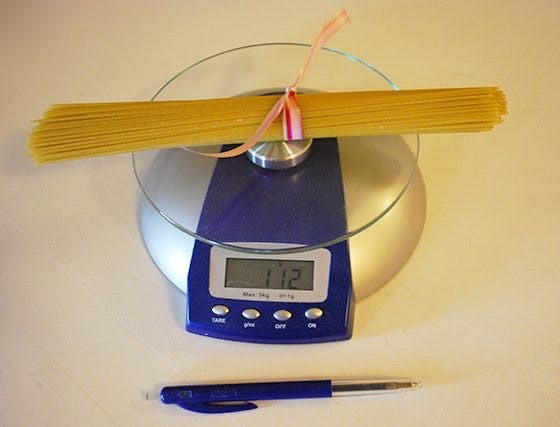 every time i eat regular pasta the scale increases dramatically the next day. i love it and can guarantee that it has never put weight on me and i ate it almost every day for 2 yrs. I lost 40 lbs on a low carb diet that included much of the DF pasta, as I was always a big pasta eater. Obviously judging by these comments this pasta has worked for many people. Interesting that all of these comments from type 2 diabetics extolling the benefits of this pasta are STILL diabetic - shouldn't still having a completely curable disorder hint to you that you still haven't gotten your diet right?? Perhaps if you want to stay diabetic and on meds you can use this pasta but if your goal is true health perhaps some changes need to be made. I have been a Type 1 Diabetic for 42 years. I have helped lots of people over the years with advice. Dreamland pasta is a huge difference between regular pastas. You don't need to check levels 20 times, REALLY!!!!!!!! LUDICROUS. I check 6 to 8 times a day. Before every meal or snack and after. I take insulin 4/5 times a day. Dreamland has never effected my levels the way regular pasta would. How many of these authors have had Type 1 Diabetes 40 years or longer. Portions are experimental to find out what works for you. Sooner or later we all cheat one way or the other. If anyone disagrees that's fine because you have not come to that bridge yet to cross over. I weighed 255 in 1976 by 1977 I was 175. Since then I never went past 187 42 years later. My voice is from experience. One more thing for anyone out there trying to control your weight, if you like vegetables and fruits that's 80% of the battle. The rest is exercise. These brand of pasta may be ok for an insulin dependent type 1 diabetic, but it's too much carbs for a type 2 trying to achieve control of blood sugar by diet alone. Type 1 and type 2 are very différent. This website is helping mainly the type 2 diabetics or pre diabetics achieve their goal of reversing their symptoms of diabetes. Moderation is the key, no matter what, where diet is concerned. If you ate a half pound of pasta at every sitting and switched to a 'carb smart' alternative, eating the same amounts how much are you going to change? You're still over-eating. Michael Meyer is absolutely correct. You need to realize, this is from a proponent of a LCHF lifestyle and the Ketogenic diet. His testing and the consumption of the DF pasta would definitely effect the ketosis state not necessarily applicable to blood glucose levels. > Get a clue....I've used dreamfields pasta for yrs for low carb weight control and I don't work for or know anyone that works for them. It just works, for whatever reason it just does and I test my bloodsugar levels after to be sure. So maybe you should get a clue and do testing for yourself, and if it doesn't work for you I feel bad because you are missing out. Out of the 300 some odd comments here, 90% say it works and even for type 1 diabetics...that speaks for itself. I have a carbohydrates intolerance, so I have be very careful. I do miss pasta, but I've made due with spaghetti squash for now. 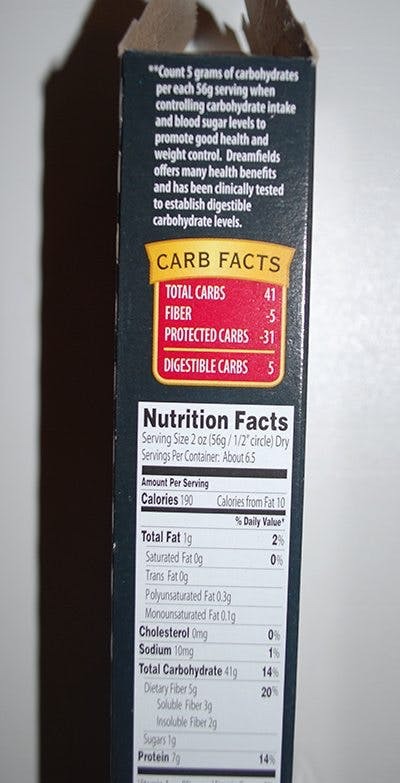 I have very large issues with companies claiming that an item is low in carbs when there are hidden carbs everywhere and often times they didn't even count all the carbs in a product. But this is an outright lie. I know that not all low carbers are intolerant but what if someone with an allergy were to ingest their product and get awfully sick? Perhaps a law suit would make them think twice. I will say this, and only because I noticed a product in one of your images that is made by a company of a different product I use..Big Train has a waffle mix that doesn't make me sick. When I ingest carbs I get violently ill...I've been using the waffle mix sort of like bisquick and it's allowed me to make a lot of lower carb items that just aren't in the market (or are horrible, or ridiculously expensive). I will also say that I'm very glad that someone looked into this before I tried dreamfields as I've seen it everywhere and have been incredibly skeptical of it's dubious claims. So thanks so much for this. I appreciate the data. Ive ate Dreamfields for over 20 years, I trusted it. I asked a few Drs and have always been told no, it is not for diabetics , but pasta has always raised my blood sugar. After trying Dreamfields, the next morning my blood sugar was not raised. So I’m confused! Over the last year my numbers are really high because I ate anything I wanted, so now I’m on low carb and bringing the number down but not losing weight, not eating pasta of any kind, after reading this article I’m afraid to eat Dreamfields, and I love pasta! Thank you for your perspective. I know I can’t play with food until I have controlled the type ii diabetes. Diagnosed 3 days ago in ER with a sugar of 619. I will sure miss my pasta for a while! All I can believe is my lying eyes when I check with my meter. I check in the morning after fasting and in the evening 2hours after eating. I can always tell when I have a "regular" pasta product vs. Dreamfields. My numbers are always a lot higher with regular pasta even though the serving sizes remain the same. Dreamfields may not be perfect but it works for me. This Italian has eaten pasta all his life and Dreamfields allows me to continue doing so with the use of a little common sense. Is 20 people a large enough figure for an accurate study? As a diabetic, Dreamfields' pasta is about the only "higher," simple carb that I eat on a regular basis - at least once a week. I have found that cooking it just 9 minutes works for me. When it no longer works for me, I'll stop eating it. I think most people are missing the point of the article. The article was aimed at the folks looking for low-carb (Ketogenic diet) NOT aimed at diabetics. He just used Blood sugar and glycemic index to test (and prove) his question. The packaging is deceptive and it clearly is not “low carb”. A normal body should clear blood sugars in less than 2 hours. This means BS should be < 120 (or <110 in Europe as they use stricter parameters) after eating anything. If a person (without diabetes) ate an entire ice cream cake decorated with candy corn and cotton candy... a normal body would control it’s BS to below 120 within 2 hours. The article showed that Dreamfields pasta was SLOW to break down and absorb the sugars. Meaning that the “spikes” in BS were not hugely high... but they REMAINED higher than they should for 7+ hours. So... while this might be ok for a diabetic diet, it is NOT ok for people to be successful with a Ketogenicdiet. Essentially people who eat Dreamfields pasta DO absorb every one of those 56 carbs...but it is spread out over the next several hours following that pasta meal. For people seeking a ketogenic diet (weight loss) a better pasta would be Edamame pasta. This is soy based, high in protein, high in fiber but low in net carbs. 8 net carbs in 2ou compared to 40 in reg pasta or veggie pasta or wheat pasta. Hope this clarify. Good luck.